As a part of our Delightful Quilting & Sewing business we vend at several quilt shows throughout the year. Recently we traveled across New York to the top northeast corner to Plattsburgh, NY. 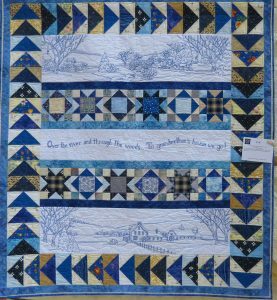 Champlain Valley Quilters’ Guild, now in their 33rd year, hosted their 16th quilt show in the field house on the SUNY Plattsburgh Campus. The theme of the show was “Treadle to Technology.” Much has changed from the days of hand piecing, or even using the “new” treadle sewing machine to piece and quilt to today when an entire quilt block can be pieced, appliqued and even quilted on an embroidery machine. All you need besides the embroidery machine is the purchased pattern. There are a number of very beautiful and very complex patterns available. when the already quilted blocks are finished, simply sew them together into the finished quilt. Other exhibits at the show including Underground Railroad Quilt, Block of the Month Display, and Common Sense and Pin Money quilt display featuring quilts and other items from the “Material Culture and Legacy of Lula Annie Butler 1909 – 2009.” Show attendees could spend a few minutes tying quilts for the club charity quilt donations, or attend one of the many demos presented by one of the show vendors. The favorite part of any quilt show for me is the quilts. 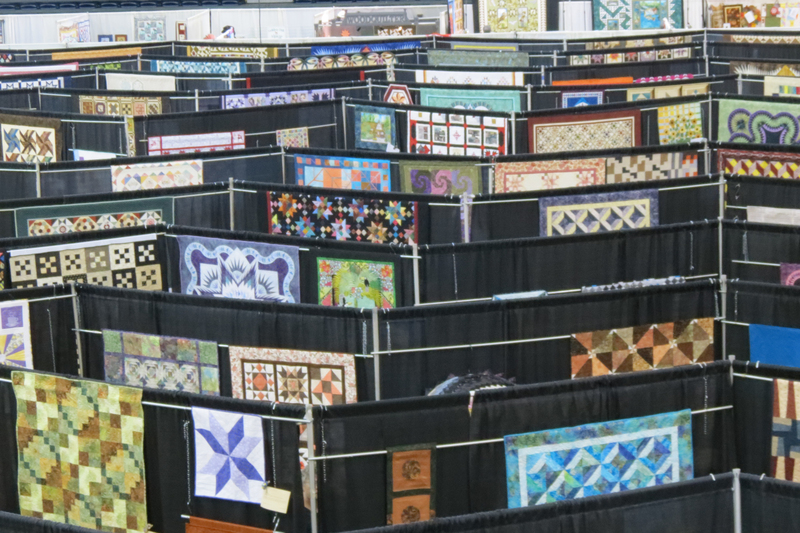 Because we are vendors at shows in different parts of New York State, it is interesting to see how regionally there are some differences in the types quilts and form of quilting on display. More and more, however, I am noticing fewer hand quilted and many more professionally quilted, usually with edge-to-edge patterns. This was the case in Plattsburgh. There were a few with some custom quilting, usually the applique quilts. 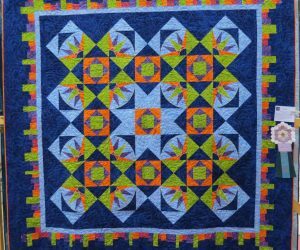 Most of the quilts displayed in Plattsburgh were not made “just for show” like you find at the large national shows, but were made to be used and enjoyed. The makers of these quilts should be proud of their fine work and I am sure the recipients of these quilts will love them, too. At some of the quilt shows the vendors can select a quilt to receive a ribbon. This was the case at Plattsburgh. My criteria for selection is: (1) design – is it unusual, or a different arrangement of a common pattern, (2) workmanship – well made, nice points, binding applied well, hangs well, (3) machine quilted – either home machine or longarm, (4) quilting pattern selection, is it appropriate for the quilt, and how well it is executed, balanced tension, etc., and (5) quilt made and quilted by the same person. I also do not give my ribbon to a quilt that has already received one or more ribbons. I want to encourage someone else who has done an excellent job, but did not receive a ribbon. Because I was running out of time to look closely at the quilts, I sent my husband, Ron out to scout out a quilt for our ribbon. He used the above criteria and came back with about five possibilities (written on his hand) for us to check out together. 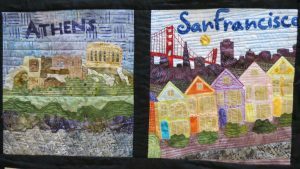 Our “winning” quilt was Compass Confusion by Karia Strauss (below). 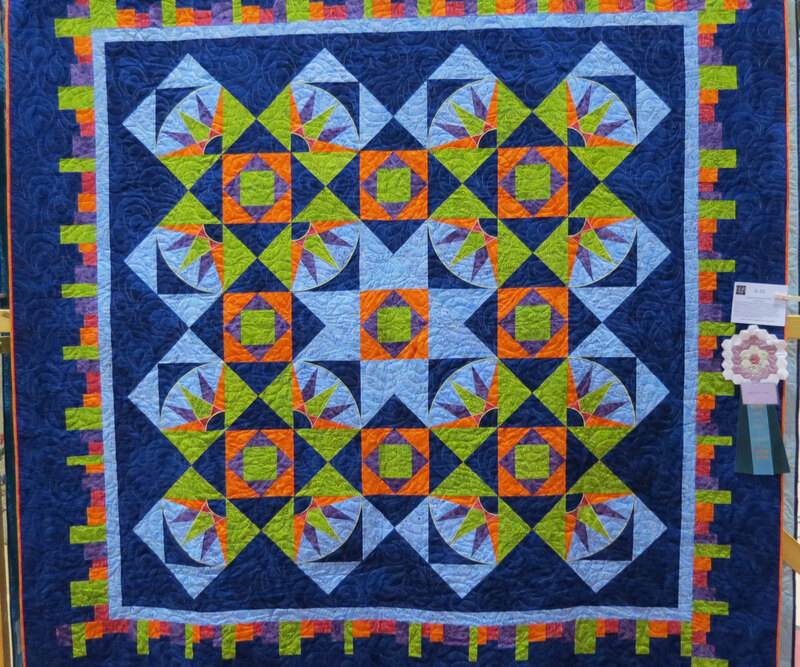 We liked the color combinations, balance of color, the unusual inner border, the pop of orange, the edge-to-edge quilting with a slight contrasting thread that gave nice texture to the quilt and definitely enhanced it. This quilt satisfied all of our criteria. 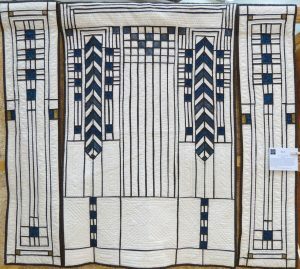 Most of the quilts at the Plattsburgh show were pieced, however, those below drew my attention because they were unusual in some way. Several were hand embroidered, others were applique, and even others told a story. 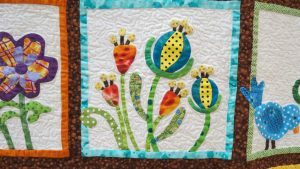 Looking at quilts, for me, is a lot of fun and I enjoy seeing how quilt makers creatively and artistically bring the whole quilt design together. Although the photos are out of order below, I am sure you can match the detail photo with the full quilt photo. I hope you enjoy seeing these quilts as much as I did. One of my greatest sources for quilting ideas is to look at the quilts at quilt shows. There are so many very talented quilters out there. 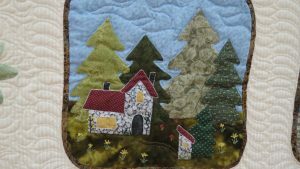 You don’t even have to go to the large national shows to see outstanding quilts as there are many beautiful quilts made by talented quilters on display at local guild shows. 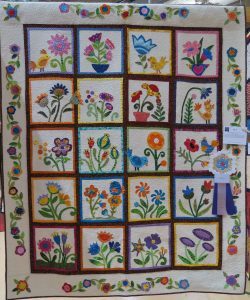 Yes, quilts at the national shows are over the top, but then again, those quilts are not really meant to be used, only displayed and sent off to shows with the hope of winning a prize. 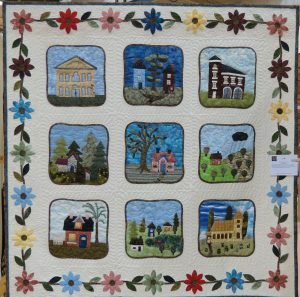 In early June, the Genesee Valley Quilt Club had their biannual quilt show, Genesee Valley QuiltFest. This was a huge show with over 600 quilts on display and over 60 vendors. 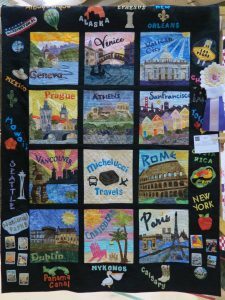 Many of these quilts rivaled those at national shows, in fact, there are a number of members who have won prizes at the national shows. Quilts, entered by club members and also non-members, were beautifully made and quilted making the judging very competitive. 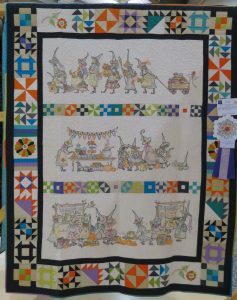 Vickie’s quilt (above) is a perfect example of the outstanding work you find at a guild show. 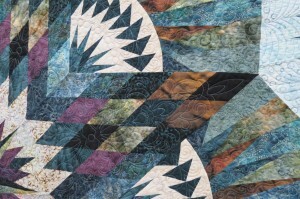 Her quilt won two awards including the Viewer’s Choice Award. Vickie quilted much of her quilt, including what is seen in the photo, at her domestic machine with what she calls graffiti quilting. The borders were quilted at her longarm. When I am at shows, what I really enjoy is taking time to look at the diversity of quilts, the unique quilt designs and the innovative quilting ideas. I do take photos as I could not possible remember all of the techniques I see. Just in the last couple of years, there have been many books published with ideas and techniques for machine and Longarm quilters. I have invested in a few of these books which range in topic from traditional to non-traditional, heirloom quilting, and even the “modern” quilting found on quilts with a lot of “white” space on them. 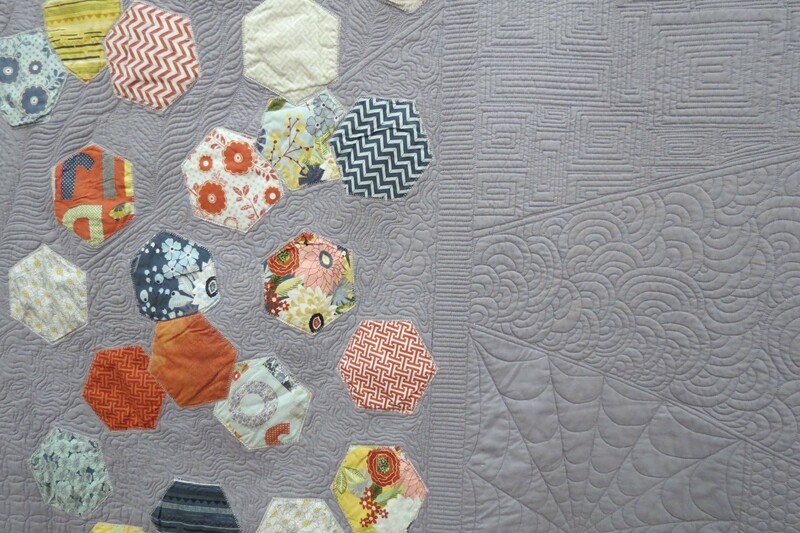 Doreen’s gray quilt (right) is a good example of a modern style quilt with a lot of open space to show off the quilting. Some books illustrate the use of stencils and templates, others are full of techniques for free motion quilting. It does not matter what type of machine you use as the design ideas will work with both a domestic and a Longarm machine. 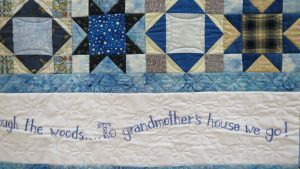 As quilts have taken on a whole different look compared to quilts ten or twenty years ago, the quilting we see in quilts today looks different, too. 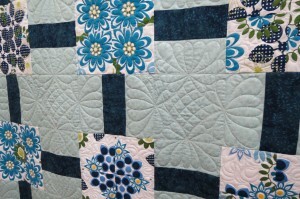 Yes, there is a time when a traditional old quilt pattern will look best with a very traditional quilting design. 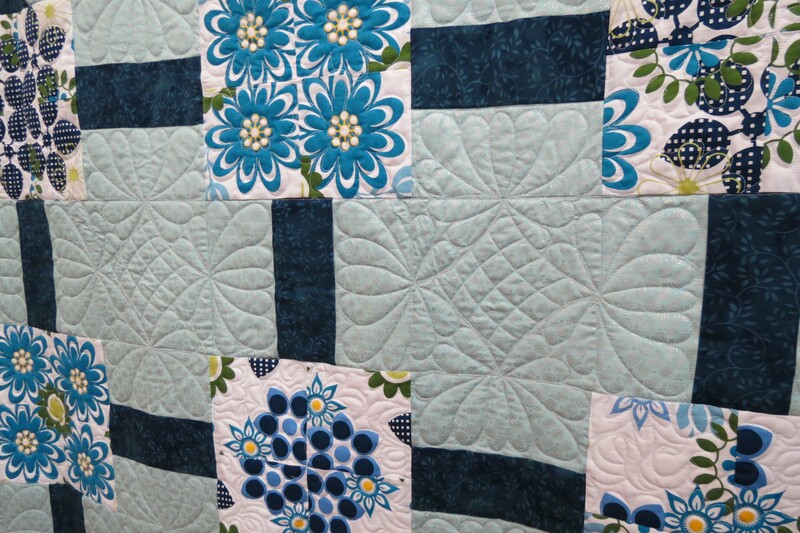 Alice’s quilt (left) is a combination of today’s contemporary fabrics and more modern design, but with very traditional quilting (longarm quilted). quiltpatterns, there is definitely room for fresh and creative quilting. 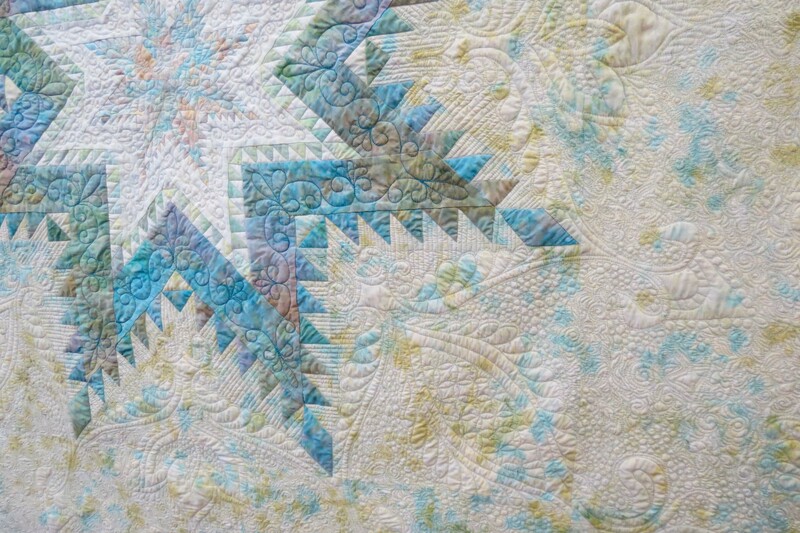 Merilee’s Glacial Star quilt (right) (Judy Niemeyer pattern) is a perfect example of using beautiful batik fabrics, paper piecing technique to get precise piecing with sharp points, and outstanding quilting designs digitized specifically for this pattern and quilted with her Nolting Pro and IQ. Next time you are looking for quilting inspiration, look no further than a local quilt show. You might be surprised. Where are some of your source(s) of quilting inspiration? After the fatal “white” screen of death last October when my Delightful Quilting blog crashed, I have been taking time to consider whether or not to reactivate the blog. Now that the big quilt show (Genesee Valley QuiltFest) in Rochester, NY is over, my quilt projects are almost caught up, and my recent hip surgery is progressing very well, I am up to the challenge of writing a blog again. So, here we go again. Blog posts will be about twice a month. I hope you will subscribe, enjoy and benefit from what I find to share with the quilting world.